At 92, he still works eight hours a day, is totally alert, and has a face that looks 15 years younger. Apart from a recent knee replacement, he is in great physical condition. Father and son sculptors Ram and Anil Sutar thrive on size. His son Anil returned from his studies in architecture and urban design in the US in 1994 to join his father who is the sculptor to whom state governments and politicians turn when they want to build a larger-than-life statue to honour a figure in the Indian pantheon. The father and son are thrilled by the Shivaji project. At 210 metres, the Shivaji statue off the Mumbai coast will be twice the height of the Statue of Liberty. Another monumental statue which they are halfway to completing is that of Vallabhbhai Patel, an important figure in the Indian freedom movement and India’s first home minister after Independence. 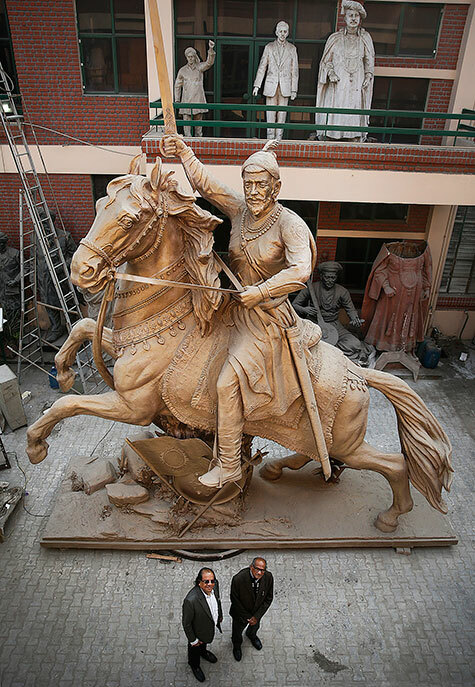 That statue will be just a few metres smaller than Shivaji. We have been worshiping cruel tyrants such as Aurangzeb and Alexander as heroes. It is high time we start emulating people of great spiritual strength who are the pillars of India. We need not one but a hundred such statues. Answering to many critics raised on this project he said, “The same things were said about earlier landmark buildings. The Eiffel Tower was criticised. If people had worried about how much the Taj Mahal would cost, it would never have been built,” he says. Ram came from humble origins and grew up in a tiny village in Maharashtra where his carpenter and blacksmith father hammered, chiselled and carved all day. He learnt early how to carve and work with metal. His high school art teacher, Shriram Krishan Joshi, recognised his talent and urged him to study at the famous J J School of Art in Mumbai. Ram had no money but his teacher paid the costs. Later, Ram got a job restoring ancient Hindu statues in the Ellora and Ajanta caves and his career was off to a good start. Over the decades, he has created some 200 statues, mostly in bronze. Some of them are in parliament, including a nearly 5 metre high Mahatma Gandhi statue in a meditative pose. But easily his most famous pieces are the bronze busts and statues of Gandhi which have been presented by the Indian government to countries around the world and installed in 350 cities. The father and son thrive on size. Gigantism is their forte. The bigger the statue, the better. “Size inspires us both. We would love to create the world’s ninth wonder, a mile-high statue, perhaps in a place like Dubai or Abu Dhabi. We’d make it of stainless steel and it would be a monument to human progress,” says Anil. Their foundry can currently handle 10,000 kilograms of casting a day. Work on Shivaji, yet to begin because the design has only just been approved by the Maharashtra government, will require 2,000 people working around the clock to finish it by the 2019 deadline. The statue will sit atop a 22-storey building housing a museum, library, auditorium, cafes and shops. Six lifts will take visitors through the body of a horse up to Shivaji’s chest where there will be viewing windows for them to look across the Arabian Sea and the Mumbai skyline. For Ram, the most absorbing phase of a project is conceptualising the facial expression. “I have to capture the essence of the person. With Shivaji, I had to bring out his chivalry and powerful personality. The horse too has worked out well – it has movement, it is fluid and dynamic,” he says. What about the criticism in some quarters that a national competition should have been held for the project, if only to throw up, perhaps, new talent?